Magnetic resonance imaging (MRI) scanners are expensive equipment capable of producing large amounts of valuable research data. For investigators to maximise their research outcomes, the data they obtain from MRIs must be stored securely, its quality verified, and it should be accessible to the wider research community. As part of a national project, Delivering durable, reliable, high-quality image data, jointly funded by the National Imaging Facility (NIF), Australian National Data Service (ANDS) and Research Data Services (RDS), informatics experts from around Australia have combined their expertise to build a network of Trusted Data Repository Services (TDRS) to provide researchers with secure places to store, share and/or publish their imaging data easily and freely. The TDRS are guaranteed to store the data and sufficient metadata for at least 10 years for use in future research. 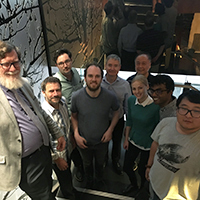 Monash Biomedical Imaging (MBI) and the Monash eResearch Centre at Monash University, along with informatics colleagues from the University of Western Australia, University of Queensland and University of NSW, has established best practices for TDRS that store imaging data from clinical MRI scanners. The team developed an example repository based on the open source imaging informatics software platform, XNAT, including plugins that enable the automation of QC/QA procedures and upload of raw imaging data. They will also publish a ‘compose’ script for the leading containerisation platform ‘Docker’ that will enable other research facilities to easily mirror the setup of MBI’s repository. MBI Director Professor Gary Egan said their clinical MRI TDRS would soon be able to connect to the Australian Access Federation. “We want to streamline access to TDRS so that anyone with an Australian university email address can easily log in and access their data,” Professor Egan said. “We’re connecting to the Australian Access Federation via an ‘OpenID Connect’ plugin, which in theory could also be used to authenticate users against their Google or Facebook accounts. Our next steps are to enhance the XNAT architecture so that we can add value to our existing informatics services. “As one of the largest and most advanced biomedical imaging research facilities in Australia, we’re always working to improve our imaging data quality and analysis to benefit the researchers using our imaging equipment,” he said. Authorised by: Chief Marketing Officer, Strategic Marketing and Communications. Maintained by: Monash Biomedical Imaging Webmaster Team. Last updated: Dec 2017.